When winter gloom has you down, and you’re weary of everything on your list of antidotes, try walking into Bead Cache in Fort Collins. Sparkling color dazzled me right away on a recent visit there, and I was struck by the endless possibilities for creativity. I’ll share my visit with you in bold images so you can see what I mean. 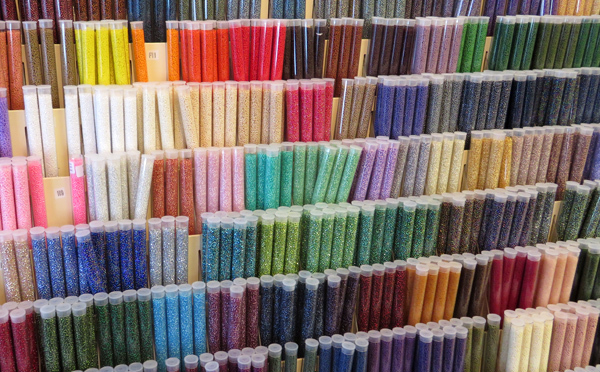 Glass seed beads line a wall of Bead Cache in Fort Collins. Owner Heidi Gore keeps the store well-stocked with beads from around the world. The tubes pictured above hold hundreds of seed beads from Japan – glass beads so tiny they’re measured in millimeters. Available in many shapes, seed beads are used primarily in woven jewelry, like the bracelet below, created by Heidi. 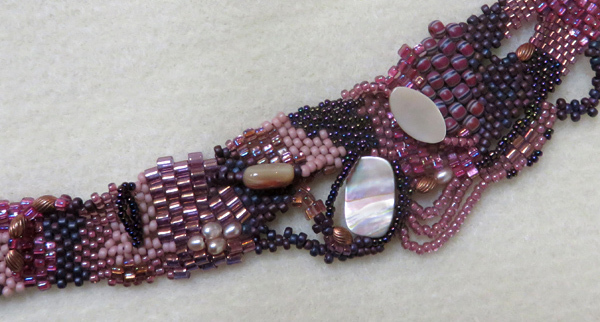 Heidi Gore wove this bracelet with glass seed beads and embellished it with stones made from shells and stone. I asked Heidi how you can open a tube of seed beads without having beads spill everywhere. Opening it over a rectangle of thin Vellux (the blanket material) prevents the beads from rolling, she told me. Vellux is her first choice in surfaces for all her beadwork because the beads stay oriented exactly as she places them. 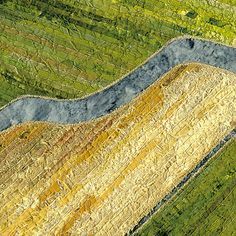 Strands of beads from the Czech Republic, long known for its high-quality handmade glass beads, look less challenging to handle. The strands, Heidi explained, are a convenient way of packaging and displaying the beads; they’re not intended to provide pre-strung beads. Bead Cache displays them sorted by color, only some of which are pictured below. 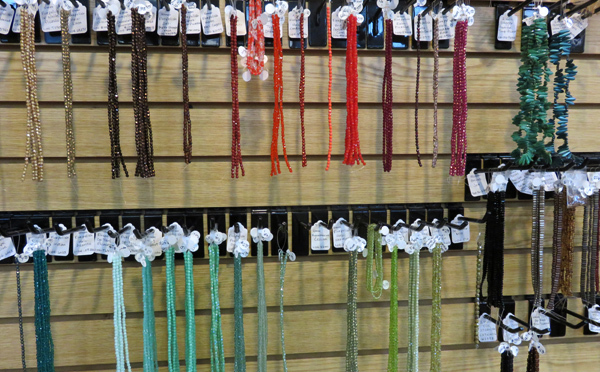 Strands of glass beads from the Czech Republic hang on the wall at Bead Cache. Next to the Czech beads hang small plastic bags of Swarovski crystal beads from Austria. Even looking through plastic, I could enjoy the way these polyhedral beads capture light. Farther down the wall hang strands of beads made from stones and shells found anywhere in the world. 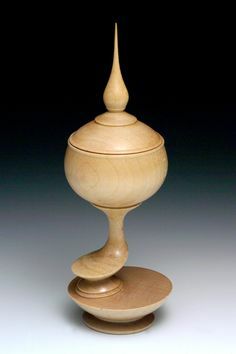 There are beads of wood and bone from the Philippines and more beads from Africa. 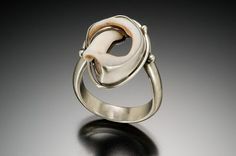 The list of possible jewelry components available at the Bead Cache goes on and on. Interest in beadwork is resurging, Heidi told me, thanks to the introduction of beads with two sets of holes. Beads that can be strung in two places allow for the creation of chunkier designs, like the bracelet below. 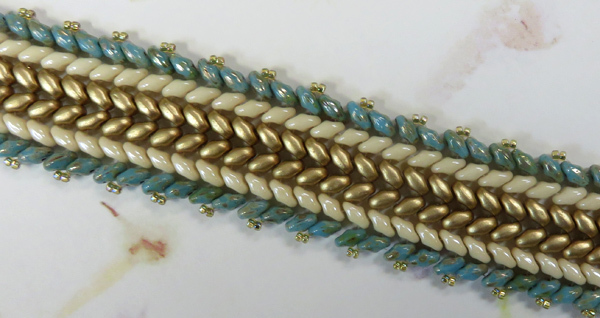 Two sets of holes allow beads to be incorporated into chunky designs, like this bracelet by Lauren Ivy, who teaches many classes at Bead Cache. Along with a myriad of beads to choose from, there are numerous techniques for assembling them. 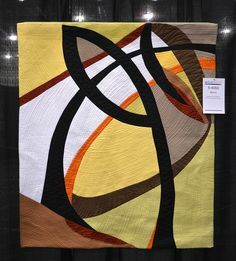 There’s weaving, crocheting, stringing, wire wrapping, leather wrapping, braiding, and knitting Viking style, for example. 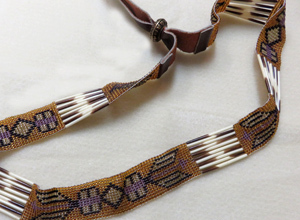 You can even use a special technique called a peyote stitch to make beads out of beads, as Heidi did to create the necklace below. The cylindrical beads are made from woven seed beads. Heidi Gore used a peyote stitch to create cylindrical beads from woven seed beads for this necklace displayed at Bead Cache in Fort Collins. In case customers want to add a pendant to a necklace, Bead Cache carries a variety of those too. I was especially intrigued by this basket of pendants from Lillypilly Designs, an artisan-owned business in Louisville, Colorado. Coincidentally, the artisan behind Lillypilly Designs is also named Heidi — Heidi Viau. 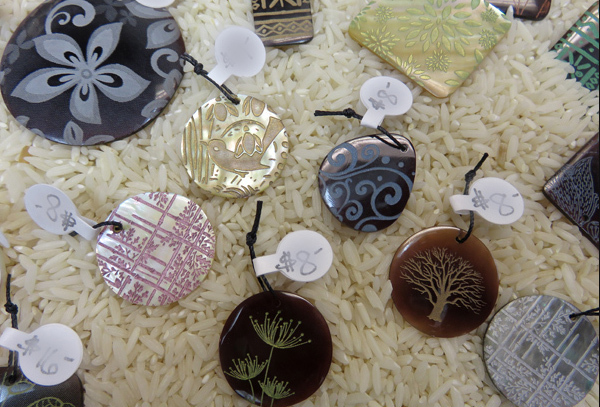 Pendants from Lillypilly Designs carry the laser-etched designs of artisan Heidi Viau. These pendants exemplify the merging of technology and art. 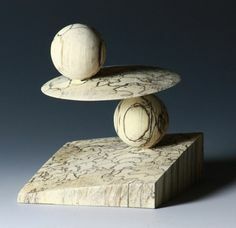 Heidi Viau creates all of the designs for these shell and stone pendants. She enters the designs into a computer program which guides a carbon dioxide laser in etching the designs onto the pendant. Even though she uses designs more than once, the pendants look unique because of the varying color and reflectivity of the shell or stone. Because of their unique nature, Heidi Gore personally selects each Lillypilly pendant for Bead Cache. To help customers take advantage of all the creative ways they can work with beads, Bead Cache offers one or two classes a week in addition to an assortment of how-to books. A list of classes for the month appears on the store’s website; signing up for the monthly newsletter is a sure way to get the list, too. Hatbands of woven beads and porcupine quills used to be the rage among ranch hands. 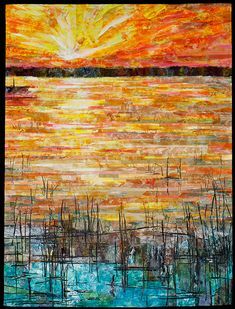 This one was made years ago by Heidi Gore, now owner of Bead Cache. What inspired Heidi Gore to open Bead Cache? Her interest in beadwork started with hatbands like the one pictured at right. This type of woven bead and porcupine hatband was enormously popular among ranch hands years before owning a bead shop crossed her mind. Heidi started out by making one for her husband and ended up selling them to a custom hat shop in Durango — 12 to 15 of them every month. Later, Heidi worked in Fort Collins at Bead Trader (no longer in business). She started going to trade shows and purchasing beads to sell at Bead Trader on consignment. 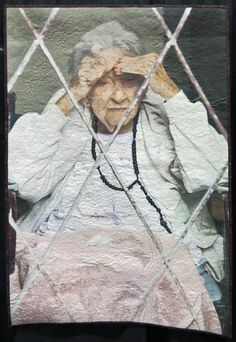 Heidi soon realized she could make more money selling beads than she could selling her beadwork. She left Bead Trader to open Bead Cache in Old Town Fort Collins. That was 18 years ago. Six years later, she moved Bead Cache to Crystal Gardens, a strip mall at 3307 South College Avenue, near Foothills Parkway. The store has been there ever since. My recent visit to Bead Cache was my first. I was impressed by how much color and variety there was to enjoy in a tidy and well-organized space. The atmosphere just felt good. I’ve never done beadwork — but I’m planning to return. 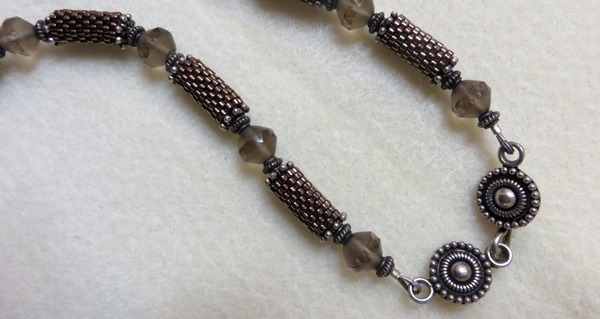 This entry was posted in Jewelry, Shops and tagged beads, beadwork, pendants on January 28, 2015 by Sally. I’m glad you enjoyed the post, Carol.